The kids are officially back to school and we’ve finally got our air back on!!! In all, we were without A/C in 110+ degree weather for nearly 2 weeks. Thankfully, we’ve got our air back on (running at full throttle! lol) and doing great! The “adventure” wasn’t as costly as it could have been if we didn’t have warranties on the parts, but it still cost a pretty penny. I didn’t include the two nights in a hotel because my mom ended up graciously paying to cover those nights away. It was a great staycation and chance for a “time out” before developing a longer term game plan (with input from you guys – thanks for the recommendations to get window units!) 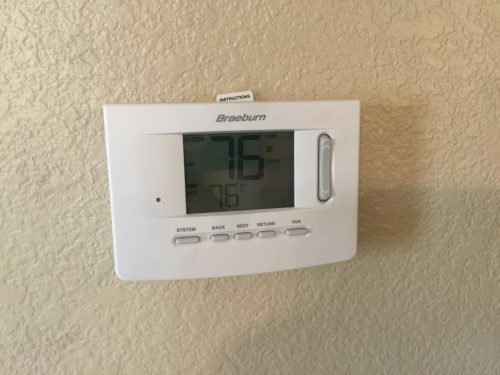 I have another friend whose A/C went out at the same time and required a full replacement. She got hers fixed in 2 days (versus 2 weeks!!! ), but she ended up spending $10,000!!!! Do they finance that stuff? If we’d had to do a total replacement I honestly do not know where we’d get the money?! We don’t even have $10,000 of available credit on credit cards so it’d HAVE to be some type of financing situation, right?? Scary thought. To survive, we stayed out of the house for much of the days. The girls were in camp 3/week for the month of July (the month of June we had them home full-time). So we’d send them to camp and I’d go to work, or when they were home we’d all go to the library or the indoor mall play area, etc. etc. I tried to plan crock-pot meals, or I would cook first thing in the morning (while the house was still cooler) and then save everything in the fridge. At meal-times, I’d just re-heat in the microwave so I wouldn’t heat up the entire kitchen. Food quality wasn’t as great, but you do what you gotta do. It wasn’t fun, but we survived. This whole situation has really put our finances front-and-center in the minds’ eye. It’s crazy that a $1450 situation had to be such a crisis (I mean…the heat played a role in seeing it as a “crisis”, too). But only eighteen months ago, a $1450 problem would have only been an inconvenience, not a crisis. We really let things get away from us, financially speaking. I’m spending some time today writing up a full August budget and figuring out ways to continue saving again. I’ve been putting savings on the back-burner in favor of paying more toward debt but what good is it when a crisis comes up and we have to use debt again to cover our butts because we have no cash on-hand??? It’s a vicious cycle we’ve got to escape from. What do you use and/or recommend for an Emergency Fund? I think I’d like to shoot for at least a thousand dollars in a dedicated EF, but I’ve also done separate savings in the past for specific things (e.g., semi-annual bills, car repairs/maintenance, etc.) and I’d like to do that too….. so maybe $1,000 in EF + other specific savings categories? Car registration and maintenance are NOT emergencies. They should be planned for. I set aside $200/month in a car maintenance fund that rolls over month to month. Then when I have big maintenance it’s a lot easier to say yes and get it done. Otherwise, I’d would just wallow and be upset over the big expense (whether I had money or not). Every year I look back and see what we spent on cars and keep a list of “upcoming” car repairs based on the last mechanic. This also cuts down on excess repairs when something isn’t brought up again you know it didn’t really need to be replaced quite yet. I also have a non-monthly bills category that splits up all annual bills (car taxes, insurance, rental insurance). It’s a lot easier to budget monthly. Your e-fund should be based on something tangible you would need to pay cash for in a pinch. Think car deductible, home insurance deductible, mortgage payment, etc. Anything you can’t put on credit. So think of your largest potential cash only expense and set that as your e-fund target. With credit card debt you will want this number optimized. Eventually (you will get back to it!) I think the living off next months income is the better way to have an e-fund. Just because it keeps it rolling and is based off a number you actually spend. It’s a lot easier not to raid it too because your accounting just does it for you. I do a separate emergency & uncommon regular bill fund. So I try to keep money there for yearly property taxes, biannual car insurance bill etc. Those are the kind of expenses that feel unexpected but aren’t really. It helps me to have a dedicated place to put that money. Nonmonthly bill savings are a must for me, unless they are so uncommon and so small that I just cover it when it comes up ($90 every 5 years for driver’s license renewal). I have $1000 for emergency fund and I saved that first. Then my other major savings funds are Home Maintenance, Car Repair/New Car, and Vet. I usually put around $100 a month into each of those. I don’t cap home maintenance or car repair because there’s the little stuff but also huge stuff, like that AC repair or a new roof. Car repairs I don’t cap because I’m saving for a new car there once it isn’t worth it to fix this one, and I’m nowhere near the $30 000 for a new car. I don’t even know if this is good advice. So maybe just ignore it, but I felt uneasy by your writing that you didn’t even have credit card amounts to fall back on. This sounds as if you rely on them as an open wallet. Far better to take out a specific credit union loan if you are able to and then pay it back religiously. Credit cards are so dangerous. Try to regard them as permanently closed. Once again I’d say cut your food spending in half. I can’t understand it. This Arizona heat was a dreadful interlude for you, put it behind you and keep cheerful. Don’t turn this into an ordinary blog–which is happening, remember your budget and paybacks. Every dollar spent this way is a small triumph. Been there, done that. Keep plugging along, and my best big wishes to you. Emergency fund target (once you get to $1000) could be 1-2 months’ total expenses. We took it to an extreme and have a half year’s mortgage payments. But it feels great! Very empowering. I think it’s certainly time to prioritize your next $1000 of extra money to a savings account. I wouldn’t call it an emergency fund, but more of an “unexpected” fund. AC repair qualifies, Christmas spending does not. Then you might return to a 80/20 debt to savings ratio. I have no clue what your current debt balances are, but when you get to a place where you’re back to student loans as your debt, you’ll want to think about if you should be more 50/50 debt to savings ratio. Also, the month just rolled over to August. It’d be a great time to do a debt update. I know it’s likely ugly and painful, but that’s half the motivation to keep making progress forward. Thank goodness your air is back on. We lived without any power at all for a week in Texas years ago after a very bad storm. It was miserable! Ashley, I do hope you can get back on track. It’s hard to offer any advice at this point. We truly don’t know where you stand on your bills, do we? I believe the tax bill is still a secret, and you have never mentioned how you racked up all that credit card debt so quickly. Yes, 18 months ago, you were cruising along! The only thing I can suggest is a bare bones budget. I have seen other families online tackling debt about the same as yours with less income and more children. In all cases, the food budget is much less. Again, that is a good place to keep hammering away. I also think you have less daycare expenses this year. Is that correct? Maybe take that money and put it toward an emergency fund. Glad you got the AC running again. I am also glad that this situation has brought to light how dire your finances really are. That may sound strange but I think you needed a strong motivator to get you back on track. Remember the pain and stress of the last two weeks, and strive to never be in that situation again. You are a strong, intelligent woman Ashley. You can do this! An emergency fund is the priority! I think you could save $1000 in two months if you really put your mind to this. Cut that food budget in half and add any savings you have from reduced childcare expenses. You don’t want to be in this situation again. We have been there before and, within our power, never wanted to be there again. Save, save, save. No restaurants, no extras, no frills. Just do it! I have no idea how to tackle the emergency fund situation. I occasionally stash cash in one of my books and call that the emergency fund. But when I had no choice but to rent a car, I had to use my credit card to book it. In that case, the available credit was my emergency fund. I didn’t take the cash out of my book to pay it, I just didn’t. Honestly, most financial planners worth their salt will tell you to build a 3-6 month emergency fund that can cover all your living expenses. This is planning for a true emergency like job loss, big medical expenses. A thousand dollars is a start, but build it up from there and don’t touch it! We are in a different situation- no credit card debt, cars paid off, just mortgage and a few other relatively low interest loans (student, home improvement, etc). We also have our main house and a rental property. We’ve used some savings on various things recently but I start to get anxious when our available cash is less than $10,000. Some of that is savings for specific things like christmas which I could dip into in a true emergency. I don’t set aside money for regular recurring expenses because we have cash on hand and can dip into it if needed, but did when we were being really aggressive with credit card, car, and student loans. I think my comment disappeared when I hit send, so I’m sorry if this comes up twice. We are in a slightly different situation in that we have two homes (one is a rental) and no credit card or auto loan debt. We have two mortgages, though, and some other low-interest loans like one student loan, a home improvement loan, etc. My ideal is that we have at least $10,000 in cash available. Some of that might be dedicated for something like christmas, which I save for every year but we could dip into in a true emergency. This is part of why I cringe a little when I hear people say “I pay as much in rent so might as well have a mortgage”. There is always something with houses and I think people minimize those costs when planning for home ownership. Some bloggers may jump in to call you smug, as has happened to me twice in the past. I know we truly have Ashley’s well being to heart. She is in a dire place and the ” magic” $1,000 figure is too small to be of much use, especially for house owners. A newly built house will often throw up all sorts of expensive problems down the road. Ashley you need to be prepared for this. Ashley you must face your situation. Cut back living expenses seriously and start to also build up an open ended emergency account. Also work at cutting down what you owe. Look at previous members of this blog. they are serious and you need to get in the same place. You have a large amount of money coming in do use it wisely. Thanks Erika – I hope it doesn’t come off as smug! I was in a really different position 6 years ago with a bunch of credit card debt, a new car, and 10’s of thousands of dollars of student loans. At that time I didn’t have $1000 in the bank but we’ve had so many unexpected expenses and my husband has had two job losses now so I get really nervous when savings dip. Mostly because I really hate the feeling of not knowing how we’re going to pay the bills, which has happened!